From the outside, Christian Piuma’s life looked incredible to anyone who knew him. He worked at a successful company and was surrounded by friends, but in his eyes, his life was anything but fulfilling. Christian felt as though he was living a double life. By day, he appeared to others as a hardworking, social person, but in reality, he was turning to dangerous substances and toxic relationships to distract him from the constant feeling that something was wrong – that this life he lived was not representative of his authentic self. Looking for some type of release from the cycle of unhappiness he was experiencing, Christian attended an Unleash the Power Within event and found the answers he was looking for. Christian previously thought that living an “extraordinary life” meant that he had to work around the clock – and that significance, if he found it, would come through his current job. He sought validation from others and craved praise for his work ethic, even though this hadn’t created long-term happiness for him in the past. Yes, he was making money, and checking all the boxes our society usually requires for us to consider ourselves successful, but to Christian, it felt like going through the motions. Living an authentic life means locating your north star – your true purpose – and either incorporating it into your life or working toward it. Too often we don’t realize what we truly want or we have trouble defining exactly what our motive is and what is missing from our lives. We end up adrift, spiraling, often turning to vices or simply becoming numb to everything around us. Christian knew he could not go on like this forever. After attending Unleash the Power Within, his perspective changed. He learned how to define his own criteria for his authentic self and created a mental image of what his extraordinary life would look like. Christian hailed that process as his breakthrough moment: “I now define an extraordinary life as the freedom of time, place and company,” he said. Once Christian realized what he wanted, he could create a pathway to it. His current actions wouldn’t lead him to the extraordinary life he envisioned; he wasn’t taking care of his body, and the time he spent at his job took away from what he really wanted to do: help others shift into the lives they wanted. UPW inspired him to make some major health changes. He became vegan and cut down on harmful substances to better align himself with his goals. Christian wasn’t able to change his habits on his own. Attending the powerful three-and-a-half-day event helped him look at his situation more objectively. He identified the limiting beliefs and behaviors that were preventing him from reaching his full potential: He was not an owner, that he couldn’t create financial abundance and that he needed medication to be happy. To create massive change, he needed to change the way he thought about himself. 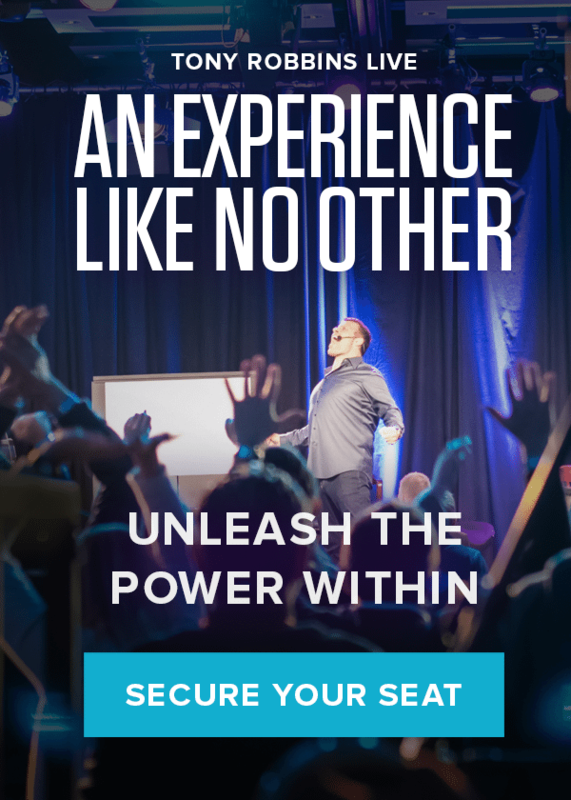 Christian left Unleash the Power Within with not only a new set of proven strategies to help him change his behavior, but with the support of people who attended the event who also wanted to watch him succeed. Since first attending UPW, Christian has attended numerous other Tony Robbins events. “The first one was a game changer for me, in terms of what I wanted to do in life. Now, it’s making those continual tweaks. I attend three or four events per year and I’m always investing in myself and I’m seeing the impact across my entire life: emotionally, relationship-wise, financially, in my career, physically – I’m just in a much more pleasant, fulfilled state,” said Christian on his experience. For Christian, living an authentic life meant departing the company that was no longer helping him grow financially or personally. He founded his own consulting business based out of Tokyo, then moved his home life to Jackson Hole, Wyoming. Inspired by Tony and the change he experienced, Christian established a life coaching practice that aims to help others find the same clarity he experienced after attending UPW. By addressing the issues in his own life, he was able to help those around him who wanted to live an authentic life, too. Unleash the Power Within challenges attendees, like Christian, to think about what they really want. Are you pursuing an authentic life? This transformative event will help you identify and strip away harmful limiting beliefs and encourage you to start living life authentically. For more information about the extraordinary event or how to take control of your life, read more about Unleash the Power Within.